Contact The Tasman Tank Co. 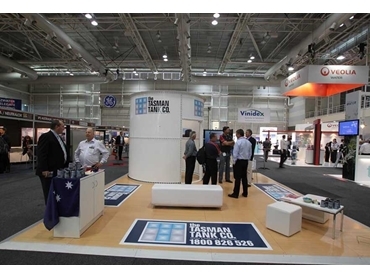 The Tasman Tank Co. introduced a display tank at Ozwater 2012 featuring some of the world’s most advanced protective coatings and construction technology. The unique display tank, the Think Tank was designed to inspire buyers to consider 21st century alternatives to conventional tank construction and protection solutions. The 3.5m high Think Tank was a miniature version of a new generation of circular heavy duty bolted steel tanks that offer a capacity of up to 30 megalitres and feature the protection of a baked-on tank coating system. The centrepiece of Tasman Tank Co’s display at Ozwater 2012, the Think Tank showcased the company’s swift and safe construction technique, used in multiple large tanks in Australia and New Zealand. Tasman Tank Co offers a cost-efficient liquid containment alternative to concrete and welded construction tanks. Tasman Tank Co has teamed up with the internationally respected Tank Connection group and Akzo Nobel, the world’s largest powder coat supplier to supply the local market with the LIQ Fusion FBE bonded system for its D103 circular tanks. Tank Connection’s International Director of International Sales, Mr George Brannigan joined the team at Ozwater led by Tasman Tanks Managing Director Mr Bryan Aldridge and fellow colleagues, Sales Manager-Major Projects, Mr David Baker and Territory Sales Manager for WA & QLD Region, Mr George Ingram to promote the tanks. According to Mr Bryan Aldridge, Tank Connection technology combined with Tasman Tank Co delivers some of the best bolted water containment systems available anywhere in the world. The new technologies offer 21st century durability and contents security for potable water, industrial liquids, wastewater, effluent, raw water, demineralised water, process water and anaerobic digesters. Tasman Tank Co’s bolted tanks find use across a wide variety of municipal and industrial applications due to their cost-efficiency as well as speed of construction on-site using modular components.